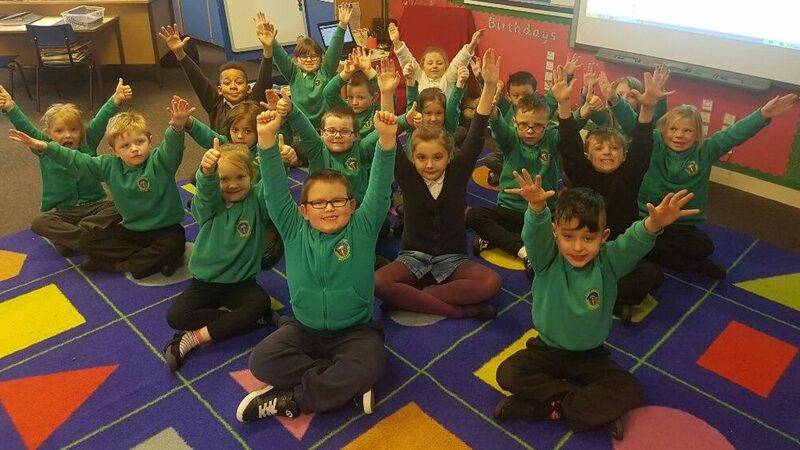 As we get closer to Christmas, the excitement in P3 is rising!! I thought it would be easier to put some information on here for the rest of term. We have been busy singing our Christmas songs for the show and will be taking part, with the other P1’s and P2’s in our production of ‘Children of the World.’ Some children have got speaking parts and these will go home today. For our show outfits we will all need ‘party clothes’ This can be anything that your child would wear to a party and we will have tinsel etc. in class. Can all clothes for the show be taken into school by Friday the 1st of December in a named bag. The show will be on Monday the 11th of December at 9.30am and 2pm. A note will go home about tickets on Monday the 27th of December. Friday 22nd of December – Holidays!! Good morning, I hope that you all had a fantastic October holiday. Here is some information for the next few weeks.. Individual school photos will be taken on Tuesday the 7th of November in the morning. All children will be getting their photo taken and information will be sent home on the day. Some of you may have heard the children talking about Baby Chloe this week. Chloe is a 16 week old baby who will be coming into our class with her mum every 3 weeks. This is part of a program our class have been asked to do called ‘Roots of Empathy.’ Chloe and her mum will be with us until July next year and over the next 8 months she will be our mini teacher. We will observe and interact with Chloe as she grows and she will help us develop empathy, an understanding of growth and the similarities and differences that there are between people. We are really excited to meet Chloe next week and look forward to sharing our learning and all of our photos with you. Parents evening appointment slips were sent home yesterday with dates and times. Trip to Crathes castle – all children will need with them a packed lunch, school jumpers/cardigans, a snack and a jacket. School trousers do not have to be worn. If the weather is good then please provide your child with suncream. I am looking for a parent helper for this trip, if you are able to help then please get in touch. P2 Achievement awards at St George’s church 11-12pm. All parents are invited to attend. As part of our homework this week, we were asked to do our reading in a different place. There were so many different places that the boys and girls chose. Other than the photos shown, Sophie-Jane read her book outside, Constance read hers in the garden and Alicja read her book upside down. It was really tricky to choose our Star Writers this morning. Next Wednesday we are going to be making dinosaur fossils and had to write instructions on how to make them. We were looking for neat writing and accurate instructions so that our fossils turn out perfect. 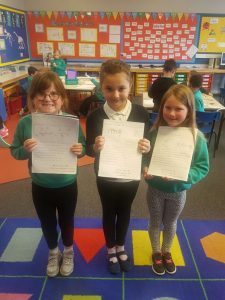 Constance, Martyna and Sophie-Jane were chosen as our star writers for this job!! Well done girls. On Thursday the 25th of May we will be going to the football festival at St Machar academy. Can the children please come to school on this day wearing tracksuit bottoms and trainers (no football boots) School jumpers must be worn as there will be other schools there. As it may still be quite cold, could all of the boys and girls also bring a jacket. We will be bringing our snacks with us on the day. We are also very lucky to be going swimming again on Tuesday the 30th of May. Could all children bring their swimming costume/trunks and a towel on this date. Over the past few weeks we have had more children buying snack from the school. Some children have been coming in with larger amounts of money than what is needed and we have change building up in our trays! Below is a price list for snack so that you have an idea of how much money your child may need. 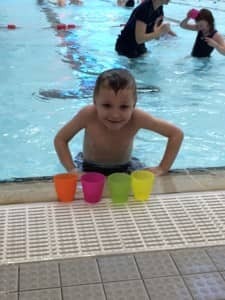 Today we had our second swimming lesson and we loved it! We have been working in 3 groups; the sharks, the otters and the dolphins. We will hopefully get another lesson after the Easter holidays. Our star swimmers for this week are Sophie-Jane and Caleb. Well done! We have no Star Writers this week as the whole class worked sohard writing their Fairytales on their own. It was too hard for MissMacAulay to choose so the whole class got an award! !When we get home ask us how we made up our stories. Borys had Snow White and the 3 billy goats gruff in a little cotagein the woods and they were lost and hungry. Leon’s story was about Goldilocks and the three little pigs in asecret cave being chased by a wolf. James had Goldilocks and a big bad wolf in a secret cave lookingfor treasure but they can’t read the map. Ashton’s story was about Snow White and the 3 little pigs in acottage in the woods and they were being chased. Alicja had Snow White and the 7 dwarfs in a little cottage in thewoods and they were very hungry. Kimberly’s story was about Goldilocks and a giant in the dark andscary woods looking for treasure but they couldn’t read the map. Lucca had Cinderella and a giant in a house made of sweets andCinderella had to get magic coins back from the giant. Constance had snow white and the 3 little pigs in a secret caveand they had to find some magic eggs for the queens cake. In Nicolas’s story Little Red Riding Hood and the 3 little pigs werein the dark and scary woods and they were lost and hungry. Ryan had Snow White and the big bad wolf on a giant beanstalkand they were lost and hungry. In Sophie-Jane’s story Jack and the 7 dwarfs were in a giant castleat the top of a hill and Jack had to rescue the 7 dwarfs from adragon. Ann-Marie had Cinderella and a big bad wolf up a beanstalk andthey had to find some magic eggs for a cake. Martyna’s story was about Jack and the 7 dwarfs in the dark andscary woods trying to find the golden coins. Claire had a Gingerbread Man and the giant in a house made ofsweets and the gingerbread man was being chased. Milan had Cinderella and the 7 dwarfs in a giant beanstalk andthey were lost and hungry. Dominik’s story was about Goldilocks and a giant up a beanstalkand they were lost and hungry. Magda had the Gingerbread man and a giant in the woods looking for treasure. 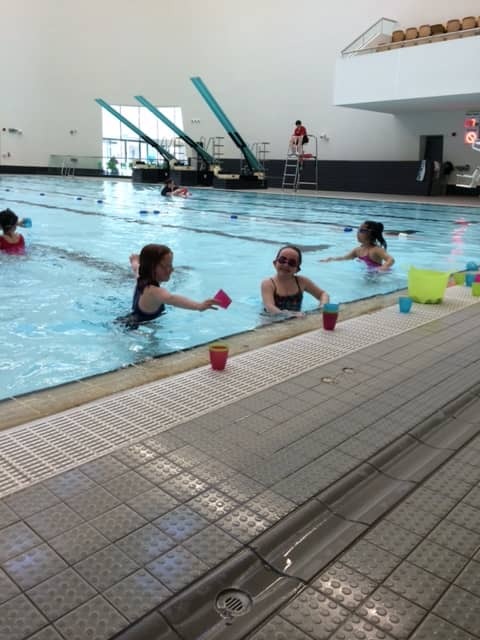 We are very lucky this term to be getting 6 weeks of swimming lessons at the new aquatics centre. So far we have been split into three swimming groups: the otters, dolphins and sharks. Each week we get into our groups and complete different activities and games. We have 4 lessons left and look forward to swimming every week!